Take a look at some screenshots with suggested changes. In this call we should discuss how to tune the Java EE perspective in a way that it is more efficient for both groups of first-time users and experienced users. It is better to show more views by default rather than less. Otherwise beginner users may miss some great functionality that can improve their experience. It is very easy for more experienced users to close or minimize the views that they don't need. We should avoid dramatic changes in the layout. Otherwise we may attain only negative effect. Better do a evolution than a revolution. We should keep all major perspectives in sync. There are users that uses more than one perspective for development and significant difference in the layout may disturb them. We can ask WTP users in the newsgroups to share screenshots of their working environment. This could be a valuable input. We could replace Problems and Tasks view with the more generic Markers view. Isn't this a step back? Actually not. This is a chance to reduce the number of stacks at the bottom docking side. The Java perspective is going to make this shift two. 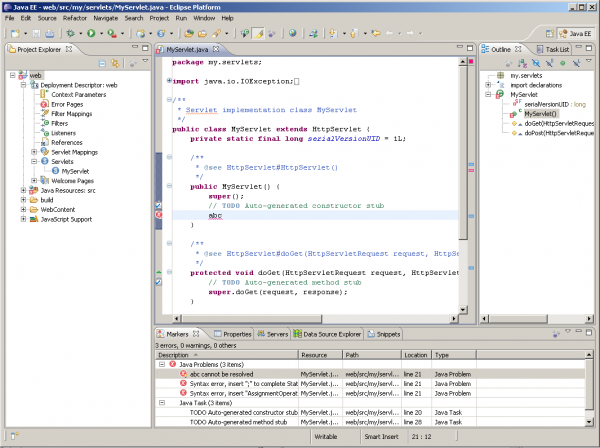 It is confusing that the Java perspective still uses the Package Explorer view. This is an inconsistency with other perspectives. Package Explorer still has better performance than the Project Explorer. It is hard to convince JDT to switch. There wasn't an owner for the Common Navigator for a long time. But there is such a person now. There is a chance that these performance issues can be addressed in the near future. Already included in the Java perspective stacked above the Outline view. It is not a good approach to have two stacks on the right. Better have them stacked together. Keep them at the bottom for now. Servers and Console view needs to be shown at the same time. One option is to have two horizontal view stacks sharing the bottom docking side. If at some point we have combined AppServer/DB view with vertical orientation we should stack it next to the Outline view. Anybody needs it? May be just adopters are able to utilize it in a meaningful way. It's better to keep it, because otherwise nobody will know about this view. Can be closed easily. Replace the Problems and Tasks view with the Markers view. Introduce the Mylyn's Task List view stacked together with the Outline view. send usage report data statistics (Mik) - done: see comment in bug 238335.
collect usage screenshots by WTP users (Kaloyan) - done: see JavaEE Perspective Usage Screenshots. This page was last modified 09:54, 20 October 2008 by Kaloyan Raev.